It's a hard fact of life that students tend to fall into labeled categories during their school years. The class clowns, the athletes, the poplar, the nerdy. We know the growing pains and awkwardness that we as adults want to forget! Teachers spend so much time with their students, they can pinpoint the boy who's amazing with classmates, but scores poorly on school work. They can also pinpoint the boy who's brilliant in math, but lacking in companionship on the playground. How necessary do you think it is to encourage both sides of the spectrum? 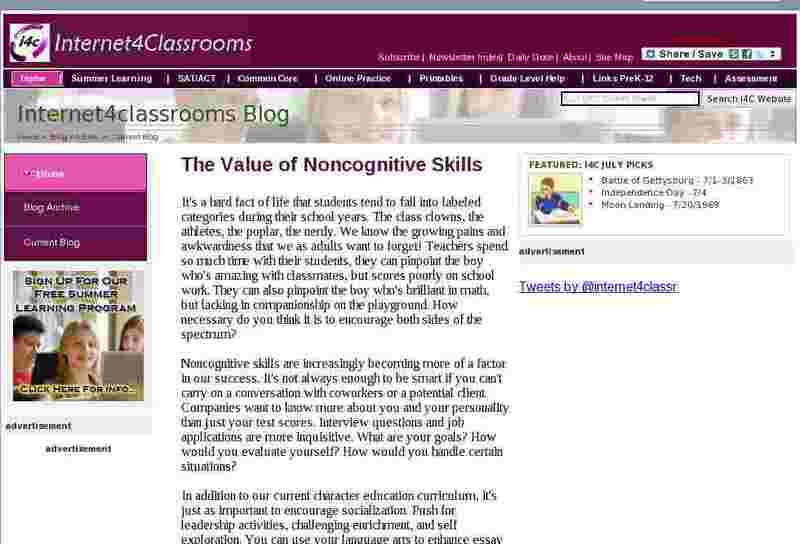 Noncognitive skills are increasingly becoming more of a factor in our success. It's not always enough to be smart if you can't carry on a conversation with coworkers or a potential client. Companies want to know more about you and your personality than just your test scores. Interview questions and job applications are more inquisitive. What are your goals? How would you evaluate yourself? How would you handle certain situations? In addition to our current character education curriculum, it's just as important to encourage socialization. Push for leadership activities, challenging enrichment, and self exploration. You can use your language arts to enhance essay writing and human narrative. Job markets aren't easing and expectations aren't lowering. The more preparedness we can offer, the better for our children.